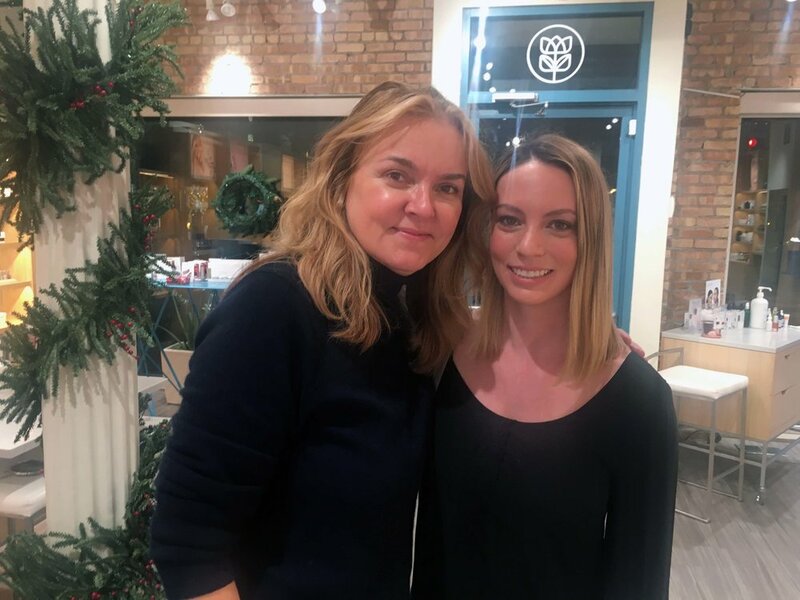 I swung by Credo in Wicker Park, a store that curates clean, eco-friendly and cruelty-free beauty products, to meet Kirsten Kjaer Weis, owner and founder of Kjaer Weis luxury makeup. Kirsten grew up on a farm in Denmark and later became a makeup artist for high fashion magazines, subconsciously carrying her love of nature along the way. As a makeup artist, she realized how rough synthetic makeup was on the skin by the reactions it would cause, but at the time, natural products just weren’t cutting it. She filled us in on how quickly toxins are absorbed into the skin and the long-term health effects that could be caused by synthetic makeups. For instance, studies show there is a direct correlation between breast cancer and parabens (though it’s hard to prove since so much is put on the body over such a long period of time, and there are so many factors over a woman’s lifespan). I’m not a scientist, so I’m not going to dive too deep into that one (yet), but I do feel pretty confident in saying that putting all this crap on our skin (the body’s LARGEST organ) is definitely not good for us. You might wonder why it’s taken so long for the beauty industry to catch on when people are running to Whole Foods on a daily basis to load up their carts with organic foods. We learned from Kirsten that it’s taken longer because clean makeup is harder to make and takes longer to produce. As Kirsten put it, “One year, the harvest might change, but the product can’t.” If an ingredient is fattier one year, it could change the color and take extra care to get it right without sacrificing the high quality. In other words, while you wouldn’t expect an organic ear of corn to look the same every time you go to the grocery store, you would surely expect your favorite blush color to look the exact same every time, right? Thinking about it this way makes me so very impressed by the care and detail put into each and every one of their products. The ingredients are sourced through an Italian manufacturer from all around the world. The key ingredients vary by product but include jojoba, coconut, sweet almond and rose hip oils, and beeswax. I was lucky enough to have a consultation with the team and noticed all of the packaging was magnetic. That’s because it’s beautifully crafted, refillable metal compacts so once you buy your first product, you only need the recyclable refill carton to replace it to save on cost and help the environment. Josh prepped my skin, and the first product he put on me was this amazing facial oil. Even though I have dry skin, I rarely go for oils because I’ve never felt like they’ve left a major impact. After using this one, my skin had never felt softer. It’s made with dioscorea batatas (a root with small white flowers called the “root of light”) and rose hip oil. It’s packed with vitamins, antioxidants and essential fatty acids and can be used as both a moisturizer and primer. My makeover only took 20 minutes total with only 9 products used, and I was blown away. The makeup is extremely light and glowy. It’s natural but all that you need. Josh taught me a little trick with the highlighter. You're supposed to replicate someone with oilier skin. Add it to the sides of your forehead, the bridge of your nose (what?!) and the insides of your eyes for that oh-so-perfect gleen. Of course, even knowing what we know about dirty beauty products these days, not everyone can afford to throw their makeup bag in the trash, so I asked Kirsten what she would choose if she had to pick just a couple things to replace right away. She responded that since your skin is the biggest organ of your body, deodorant (which goes straight to your lymph system) and body lotion have to be the first to go. For makeup, whatever the body can absorb the quickest. Next to go would be foundation, followed by mascara. I don’t know about you, but I’m tossing my makeup bag and making to switch to Kjaer Weis. Don’t take my word for it though, this Daily Mail article documents a girl who wore Kjaer Weis makeup to bed while having a dermatologist analyze the before and after effects. The results are pretty incredible!